A week or two ago I was lucky enough to be invited to an event held by Palmers Cocoa Butter and what a fabulous event that was. We were pampered with manicures, hand massages and plied with creamy caramel cocktails, macarons and met the lovely PR team. As if such a luxurious evening wasn't enough I travelled home carrying a heavy goodie bag filled with many of the products to try for myself at home. I don't know about you but I was slightly ignorant that Palmers Cocoa Butter had such an extensive range of products. Of course I was aware of their famous Cocoa Butter body lotion and the Summer hit Natural Bronze Body Lotion but so many other products were not on my radar. It'll come as no surprise to you that I dived straight for the hand cream as the first product to try. This is the perfect hand cream for the Winter when hands become extra dry in the colder temperatures and it has been especially formulated with oats and soy that will soothe irritated hands. Whilst my hands aren't particularly dry I can't speak to those claims but I can tell you how much I'm enjoying using this hand cream. Firstly it's thick and creamy unlike many hand creams which can be thin and/or watery but it doesn't smother the hands so they're left greasy. In fact it feels like it dries quite quickly but unlike the L'Occitane hand cream I review last week (which you can read here) it doesn't leave them dry but extremely moisturised. For this reason of course it passes my mug test (you know the one, can I pick up my cup of tea without fear of it slipping out of my hand) but I don't feel I need to constantly reapply as the moisture is retained. That said of course every time my colleague at work puts her hand cream on I reach for mine. I've worked my way through many hand creams this past year and this is definitely going to the top of the list - and even better it's so cheap. If you need to find something extra to pop in someones stocking at Christmas I'd give this the thumbs up and without any fragrance it'll compliment men and women. If you're a fan of the Palmers Cocoa Butter range of products let me know in the comments what your favourites are as I can't wait to dive into the rest of my goodie bag. 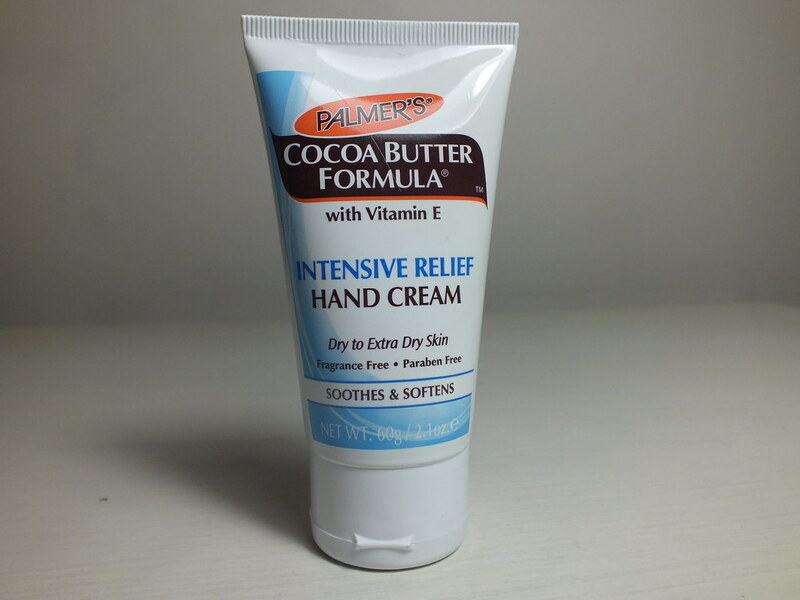 I Heart Palmer's Cocoa Butter product <3 I don't think I tried the hand cream but at the moment I try anything as my skin is really cracking up. I need one of these right now I think, the cold weather has already taken its toll on my hands! I'm very happy to see that this is available in the US. I so need a good hand cream. Thanks for the review! My hands suffer terribly during the winter. I can't stand handcreams that take ages to absorb - so if this passes your mug test I'll give it a try. I always have hand cream on hand during the winter, it's definitely a handbag must! I love Palmers as well, definitely one of my fav moisturiser brands. Virgin Atlantic Premium Economy - Is it worth it?